The African National Congress says Black First Land First leader Andile Mnxgitama is in violation of his court order and should be arrested by the end of the day. This after BLF members attempted to enter a Daily Maverick event hosted at the Cape Town International Convention Centre on Thursday. They were, however, stopped by security. Mngxitama and members held impromptu speeches beyond the ropes of the event, despite a court order interdicting the group from continuing to harass members of the media. They called the Daily Maverick fascists for blocking their entry, and claimed they had tickets to the event, and merely wanted to "engage" with the journalists. "Andile Mngxitama and BLF are in contempt of court, and we don't understand why police is taking long to implement the court order," ANC national spokesperson Zizi Kodwa said on Thursday. "Somebody is going around to intimidate journalists in violation of the court order. "We call on police to take firm action, otherwise people will continue to undermine the authority of the police and especially the courts." Kodwa said the High Court had spoken and protected the rights of journalists against intimidation. Mnxgitama and BLF had not been invited to the event as journalists, he said. 'He must sleep in jail' "Their intention was clearly to disrupt that event. Therefore, police should have been alerted," Kodwa said. 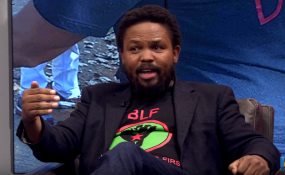 "In fact by now, Andile Mngxitama, in particular, should be behind bars." "We call on police that, by tonight he must sleep in jail for violation of the court order." Mngxitama was earlier stopped by security at the entrance of the venue. "You are not giving us a right to reply. We are here to engage in a civil manner with Daily Maverick and amaBhungane, who are lying, and generating fake news," Mngxitama claimed from behind the ropes. He also said the media were making up claims about the party being funded by the Guptas. "Where is the evidence? The emails is not evidence," he continued, and again dismissed the legitimacy of the #GuptaLeaks. Approximately six members of the SAPS arrived on the scene after 30 minutes. BLF's attempts seemed to fizzle out, and they eventually left in a red Audi after an hour. The Daily Maverick, meanwhile, reported on Thursday that the red Audi Mngxitama used to leave the venue was owned by Brian Molefe's son Itumeleng, a student at the University of Cape Town.